"as soon as the truck went off, up went the smoke-signals". Stranded at the Hull River, Lasseter writes at page 90 of his diary, that he tried unsuccessfully to get the Aboriginals, "to send a smoke signal to Alice Springs", from the Petermann Ranges, a distance of several hundred kilometres, again Idriess and Lasseter display their extraordinary ignorance of matters Aboriginal and again one wonders who penned the diary. The use and efficiency of Aboriginal smoke signals is a vigorously debated topic amongst bush anthropologists, who tend to make highly exaggerated claims regarding the speed and distance of transmission and detail and purpose of the message. Blakeley spent some time studying the signals and "paid close attention to the dawn smokes for this is the time they talk in figures. These smoke experts can send up a dotted line of smoke clouds that stand up thousands of feet in the sky ~ it would be quite possible to see these dotted lines a hundred miles away". Blakeley also noted that when the expedition changed course 90 degrees, "Sure enough the smokes altered, two short puffs then a long one", Blakeley acknowledged that he did not understand the system, but felt sure he would recognise any hostile intent in the numerous smokes seen by the men, especially between Illbilla and Mount Marjorie. Micky was no use with interpreting the signals and Blakeley decided that as he had spent all his life on a cattle station he had probably never made a smoke before. According to Idriess however, the real experts in smoke talk are the Pitjanjajara of the Petermann Ranges, by using the appropriate signals, these men first confirm, that their message will be acknowledged and passed on by neighbouring tribes, 'clearing the line' as Idriess puts it. That done, a signaller is capable of a truly elaborate message, starting with a perfect smoke ring, "like an enormous life belt, followed by a smaller ring which shot up through the larger. These were followed by another long ring and a quick short one until the addition of a different bush sent up a rolling black ring, Thus they talked", with adjacent tribes for any news of Lasseter's companions. Apart from smoke rings a clever signaller can use broken or uninterrupted columns, spirals and corkscrews, large or small and puffs, "that flattened out and drifted as lazy clouds when high up". The smoke could be white, blue, grey or black depending on the type of fuel and heat of the fire, such expertise shames celluloid Apaches and could lead to the redundancy of the Overland Telegraph Line. It's fortunate that the highly regarded anthropologist, C.P.Mountford made a study of Aboriginal smoke signals in Central Australia, his opening comments on the subject are worth repeating, " White men have told me some amazing stories on the subject, most of them involving the transmission of information of interest, not to the aborigines, but to the white man". Mountford relates the amusing story of a miner whose Aboriginal helpers were able to inform him by smoke signals, a day in advance, of the arrival of unexpected visitors, including the name of the driver, the number of passengers and the make of the vehicle!. 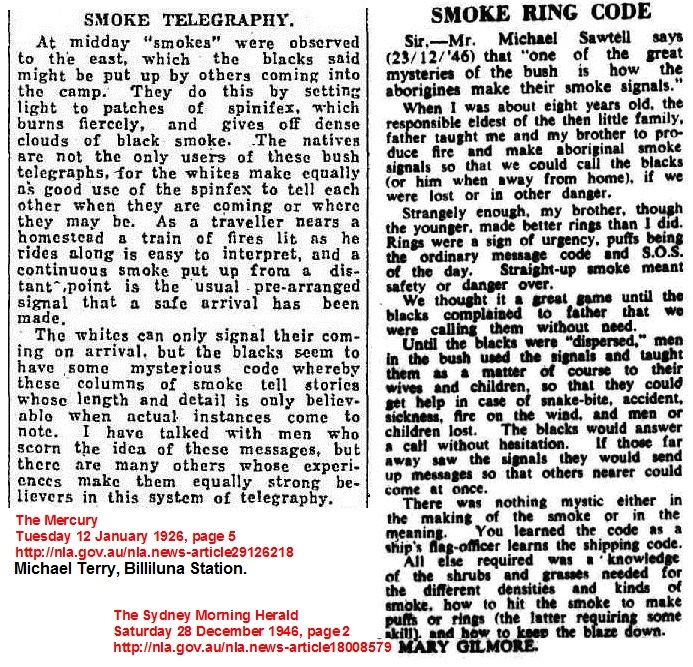 Mountford's Aboriginal companions confirmed what he had long suspected, that the method and purpose of smoke signals is very simple and complex details cannot be transmitted. There is also the problem of weather conditions, Central Australia can be mighty windy, ask Bob Buck. There are two prosaic reasons for smoke signals, to indicate the whereabouts of travelling hunting and family groups and to alert a camped party of your approach. It is true the signals can be seen for a great distance in the generally flat country of inland Australia. The inflammable spinifex, which is frequently lit during the daily round, gives off a column of dense black smoke that can be seen for twenty miles or more, well within sight range of the small family groups whose membership is well known to each other. It should come as no surprise to the white observer that the Aboriginals can deduce with a fair degree of accuracy the name of the signaller and depending on the time of day, the success or otherwise of the hunt or the location of the nights camp. Those clever smoke talkers of Idriess, would have considerable difficulty in producing smoke rings of any size or colour if they used the highly inflammable and usually quite uncontrollable spinifex. Mountford concludes, "Although the last word has yet to be written on the smoke signals of the aborigines, I am convinced that much which has been recorded about them is as exaggerated as the accounts of Indian rope tricks, hoop snakes and mulga wireless". Blakeley Fred Dream Millions 45,87,88,90,91,108,127. Coote E.H. Hell's Airport 108. Idriess Ion L Lasseter's Last Ride38,39,46,52,68,97,140,215,216. Mountford Charles P Brown Men and Red Sand 107,108.